Whether we are out walking, taking a trip to the shops or riding a bicycle or motorcycle, the air that we breathe is not as clean and fresh as you might think. This apples especially if you are in a town or city, where many years of constant pollution have left their mark not just on the buildings surrounding you, but in the very air that we breathe. This is the case not just in the Western world; in many cities in the Eastern countries – China and Japan especially – pollution is such a problem that wearing a face mask when out of doors is a necessity. Is this a requirement where you are? You might be surprised how much protection you will get from wearing a face mask when riding your motorcycle, and there are some that are designed to fit under a helmet. Let’s check out some of the benefits. The first benefit of a motorcycle face mask filter, and indeed of any anti pollution mask, is that of protection against air pollution from the many gases and other pollutants that have gathered in the very air we breathe. Indeed, this is not a new phenomenon; major cities, such as London for example, were engulfed in damaging smog over a hundred years ago when industry was rife and pollution was misunderstood. These days, we know the dangers, and the problem is caused more by vehicles and others sources of greenhouse gas emissions. The face mask will help protect against you breathing in these gases, and allow you a safe journey. If you suffer from allergies, and there are many different forms and causes of allergy to deal with, a face mask will be a great help. If it’s pollen that is the problem, then this can even get to your when wearing a motorcycle helmet, so a mask filter is a great idea if you want to enjoy more comfortable rides. This is also a recommended course of action should you suffer from asthma, which is a common complaint these days. You might wonder why, whenever you go to the city or a large town, you come home with a headache or even worse, a migraine. 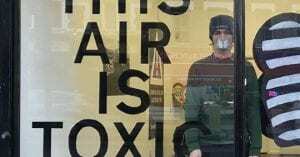 It could well be that the poisonous pollutants you are unknowingly breathing in are the cause. Some of the pollutants in the air are not meant to be ingested or inhaled by us and affect the body in a variety of ways. Carbon monoxide, for example, is mildly harmful in the small doses that hang in the air (and much more so in bigger quantities) and is proven to cause headaches thanks to it being an impurity in the bloodstream. Wearing a mask under your helmet, especially one with filtering qualities, is always a sensible option if you want to guard against this. Particles – soot, dirt, dust and pollen can all be swept up into the air and easily inhaled, and it doesn’t bear thinking about what particles you are actually inhaling. As you can see from the above, pollution in the air that we breathe is commonplace, varied, and can be very harmful. 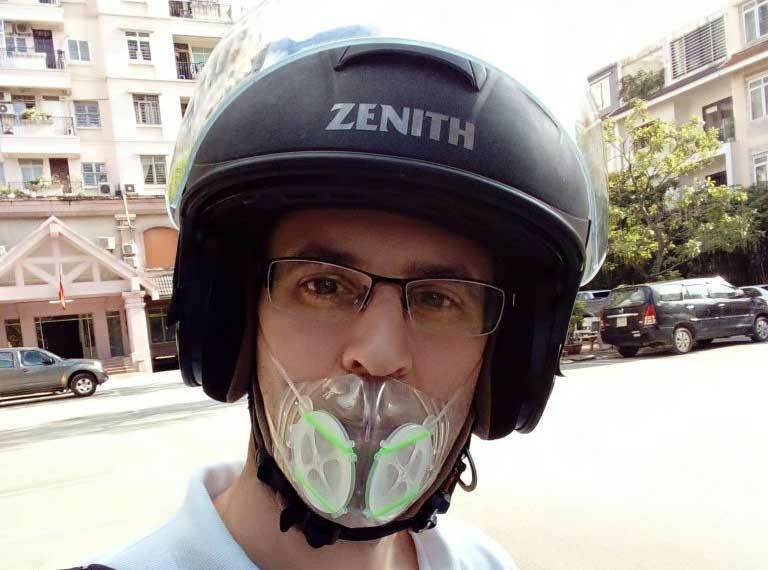 For motorcyclists, especially if you ride in built-up areas perhaps on a daily commute, a mask with a filter is a great way of ensuring you have the best protection against pollution so invest in one now, it will cost you very little and you’ll be surprised how much fresher you feel.